What Are Protective Environment Rooms? 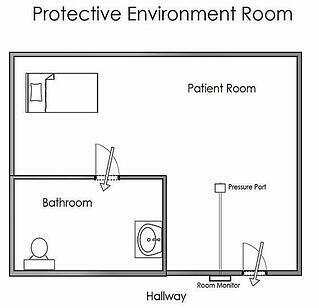 Protective Environment (PE) rooms are hospital rooms designed to protect a high-risk immunocompromised patient from human and environmental airborne pathogens. These are positive pressure rooms intended to keep patients safe during recovery from cancer treatment or stem-cell transplant. PE rooms are a specialized application of a hospital’s HVAC system, where the airflow supplied into the room is balanced with exhaust airflow to create at least +0.01” WC positive differential pressure with respect to an adjacent space, usually the hallway. In simple terms, this provides a gentle flow of air under a closed doorway and into the hallway so that no airborne particulates can enter into the patient’s room. In PE rooms, recirculation HEPA filters are usually applied to increase the equivalent room air exchanges. Outdoor air changes are still required for sufficient clean air. 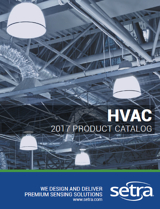 Constant volume airflow is commonly used in PE rooms, but there are provisions in healthcare codes to reduce air changes per hour when the room is unoccupied in order to save energy. For PE rooms, the most efficient way to measure, monitor, and alarm on room pressure conditions is using a monitor that can support two rooms, like the Setra SRCM.